Police are investigating a deadly attack targeting a census team and soldiers guarding them in Lahore, Pakistan Wednesday Morning. At least four of those confirmed dead were soldiers guarding the census team. Twenty-two others were wounded in the bombing. A team carrying out Pakistan’s first census in just under 20 years was the primary target of the attack. Authorities had sealed off the area on Bedian Road in the capital of the Punjab province after the blast. Rescue officials claim the attack occurred just before 8:00 am local time. The attack on Wednesday Morning was executed amid a coinciding wave of bombings allegedly caused by Islamic radicals in recent weeks. At present no militant organisation has come forward to take responsibility for the latest attack, though Pakistani Taliban are suspected. Khwaja Imran Nazir, the provincial health minister in the Punjab province, had recently confirmed the death toll while speaking to field reporters outside the hospital. “The target seems to be the census team and the soldiers guarding them,” Malik Ahmed Khan, a spokesperson for the provincial government, told local television news channel Geo. “Sacrifice of precious lives of civil enumerators and soldiers is beyond any doubt a great sacrifice,” Pakistan’s Army Chief Qamar Javed Bajwa added in a statement. He withheld information about the number of soldiers killed in the bombing. “Conduct of Census will be completed at any cost,” he added. Pakistan’s Bureau of Statistics started its first population census since 1998 last month. They worked with the military, which has deployed 200,000 troops to give security for the census. Approximately 119,000 government employees are taking part in the exercise, acting as enumerators for the activity. This comes as the second attack in Lahore in the last two months. At least ten people were killed after an explosion tore through an upmarket area of Lahore in February. 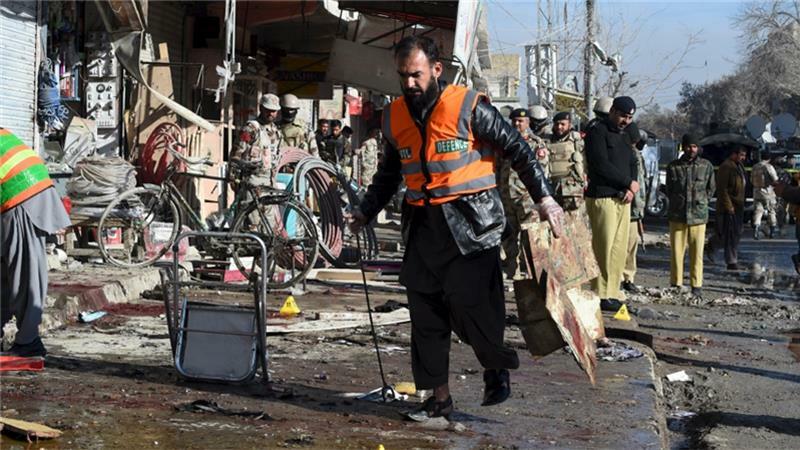 A car bomb exploded in a market in a mainly Shia area of Pakistan’s Parachinar region last week. 22 were killed, and 57 injured. This attack was claimed by Pakistani Taliban. J. Kinast is an aspiring independent journalist working with WeAreChange, as well as politically within the UK Independence Party.